Keeping Landscapes Beautiful Since 1991. We are currently hiring for all positions. Brush Creek Landscaping is a full service landscaping company serving Vail Valley, Eagle County, Summit County, and the Roaring Fork Valley. We offer a variety of Tree & Plant Healthcare and Turf & Lawn services related to your residential or commercial landscape. With ISA Certified Arborists®, an ISA Certified Tree Worker Climber Specialist®, an ISA Tree Risk Assessor, and our Professional Turf Management Team, BCL brings a wealth of knowledge, expertise, and experience to every landscape. BCL not only has the in-house expertise but the right equipment to handle any landscape challenge. Everything from lawn aerators and irrigation system parts, to stump grinders and crane & bucket trucks allows us to get the job done. BCL started local and we remain local, making it a priority to employ and serve the very people that live and enjoy life here in the Rocky Mountains. 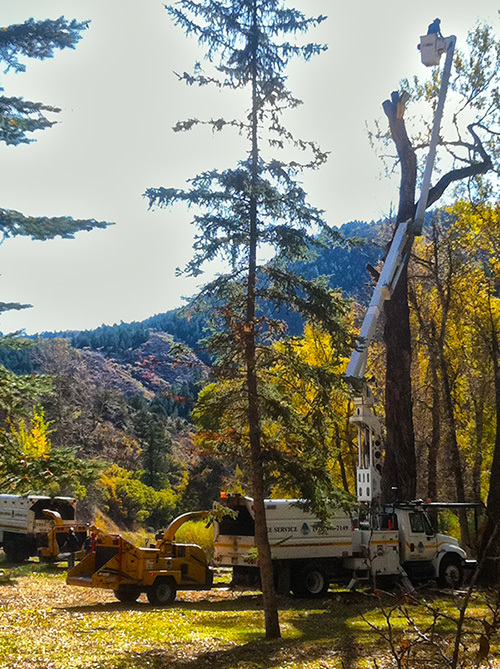 Choosing a tree care company with ISA credentials means that that company possess a high degree of knowledge about caring for and maintaining trees, shrubs, vines, and other perennial woody plants. To earn an ISA Certified Arborist® credential, one must be trained and knowledgeable in all aspects of arboriculture. ISA Certified Arborists® have met several benchmarks and requirements before passing a formal exam. The benchmarks and requirements include three or more years of full-time, eligible, practical work experience in arboriculture and/or a degree in the field of arboriculture, horticulture, landscape architecture, or forestry from a regionally accredited educational institute. This certification covers a large number of topics including a code of ethics allowing you, as a consumer, to better trust their credibility and reliability. We aren't happy until you are happy! Eagle Ranch Village Homes H.O.A.